The newest housing development within the city of Paynesville is nearly finished and already has a new house. The last layer of bituminous was laid last week on the streets in WilGlo Acres, the city's newest development. After more than a decade without expanding the city limits, in a little over a year, two housing developments have been annexed to the city, platted, and made ready for houses. 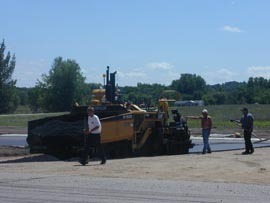 Street work was completed last week in the WilGlo Acres Development on the north edge of Paynesville. Willie and Gloria Scheel own the first house, seen in the background, in the project. The 38 acres for WilGlo - which is located along the North Fork of the Crow River on the west end of town - were annexed into the city in February of 2000. Two lots have already been sold in the development. WilGlo was the second annexation to the city in 2000, after Project 55, which added 15 acres on the south edge of town. Two homes have been completed on the 18 lots in Project 55, and four others have been started. Another development is being considered on the east edge of town. The lack of expansion of the city limits is one reason why the city stagnated in the 1990s, losing eight residents according to the 2000 census. WilGlo originated when long-time city residents Willie and Gloria Scheel started looking for a new home. They purchased the acreage along the Crow River in 1999 and started plans for a development. Two square blocks of the land were already in the city limits but had never been developed. They envisioned 34 lots, including six commercial sites, in the development, but their original plans were delayed by a discovery. Two lots had been set aside as a public square in 1857. Scheel used a quitclaim to gain ownership of these two lots, but broke up the development so part of the road and utility work could get started last fall. Because of the legal glitch, the Scheels platted the western portion of the development into 20 lots. The remaining 14 lots on the eastern half of the development will be platted at a later date. This area will include some commercial sites and possibly several senior housing units. Road and utility work started in the development last fall, but was not finished before the onset of winter, causing the project's completion to be set back to this summer. The Scheels have the distinction of the first home erected in the new addition. They hope to move in within the next two months. The city of Paynesville and Paynesville Township reached an orderly annexation agreement in March 2000. This agreement made the annexation of these developments possible. Under the orderly annexation agreement, the city and township share tax revenue over a five-year period for land annexed into the city. In the first year after annexation, 90 percent of the taxes go to the township and 10 percent to the city. In the second year the township will receive 70 percent of the tax revenue and the city 30 percent. If the property is developed, the city and township will share the tax revenue equally in the third year after annexation. In the fourth year, 30 percent goes to the township and 70 percent to the city. In the fifth year, 10 percent goes to the township and 90 percent to the city. However, if the property is not developed within two years, 70 percent of the taxes will continue to go to the township and only 30 percent to the city until water and sewer lines and curb and gutter are installed. This clause was added to deter unnecessary annexation to the city.